I am reprinting several earlier articles from the old forum in this thread in the new forum. One aspect of the HDS Gen2 Touch that was somewhat troublesome for me was the screen dimension. And here I am using aspect as an intentional double entendre. The HDS Gen2 Touch screen has a much different aspect ratio than the HDS units that preceded it. My HDS-8 has a screen with pixel dimension of 800 x 600, which is the classic 4:3 ratio. Display screens with a 4:3 ratio were the most common for decades. The 4:3 ratio was a product of the NTSC television standard. Television display devices needed to display an image from television video that was transmitted in a 4:3 format. The display industry made 4:3 displays in huge volume to provide television manufacturers with suitable displays. You don't have to be a math savant to figure out that the new model has a screen with fewer pixels than the old model. There are 96,000 fewer pixels on the HDS-9 than on the HDS-8. That is a loss of 20-percent of the screen. It seems entirely reasonable to say that the HDS-9 has a screen that is 20-percent smaller than the HDS-8. If the model numbers were going to be assigned so they were proportional to the number of pixels on the screen, we should call the HDS-9 the HDS-6.4 instead. In this comparison the HDS-9 looks better. The screen area is actually larger than the HDS-8 by about one-square-inch. Again, if the model numbers were going to reflect the screen area, then the HDS-9 would be called the HDS-8.4. The matter of the screen aspect ratio is made confusing in part by Lowrance. In the Lowrance literature they describe the HDS-9 as having a "widescreen, 16x9 display." Clearly a display with a 16x9 aspect ratio is one with a 1.77:1 aspect ratio. However the pixels on the screen are in the ratio of 800:480, which is a 1.66:1 ratio. Now we see that the screen area of the HDS-9 is less than we thought, and the improvement over the HDS-8 is only by 0.8-square-inch. The other comments about the number of pixels are not affected because the number of pixels is the same in either case, but the actual screen area is different, making a difference in the density of the pixels, which is now 11,066-pixels-per-square-inch, a slight improvement over the first calculation (which assumed a 5:3 aspect ratio). If you want to check my math, see http://en.wikipedia.org/wiki/Aspect_ratio_(image) for the formulas. A further problem in the screen dimension is the orientation. It might be said for a SONAR device that the most important screen dimension is vertical pixels. Vertical pixels show the water column details. Horizontal pixels show the water column history. For the fisherman we might postulate that vertical pixels are more important than horizontal pixels. On the typical SONAR presentation the pixels about to scroll off the screen on the left are not as important as the ones coming on the screen at the right. We also see that in some really high-end SONAR devices the traditional 4:3 display has been rotated to give a 3:4 display in order to favor more vertical pixels. For an example, look at some of the very expensive Furuno SONAR devices; they often have 3:4 aspect ratio displays. Thus, in the sense of vertical pixels being important, the HDS-9 suffers quite a bit. It has only 480 vertical pixels compared to 600 vertical pixels in the HDS-8. That is a loss of twenty percent of the vertical pixels. For navigation purposes the most useful display might be a square display or an aspect ratio of 1:1. If we typically plot the boat's present position in the center of the display then a square display gives the best presentation of the environment around us. As the display transitions from square to wide-screen the display begins to lose value for presentation. If the boat position remains in the center, we'd have a varying distance shown on the display in various directions. Assuming we use a North-up display, with a widescreen we can not see very far in front of the boat when going North or South. It's much better when going East or West. If we use a Course-up display we are always in a bad situation, as we see farther to the sides on the display than we do ahead and that is a constant problem. It is only if we use an off-center or look-ahead bias to the display and use a Course-up option that we get any value out of the wide screen for navigation. Perhaps the value of the widescreen display will be that it can add some menu or information displays to the side of the navigation display, leaving a more or less square area in the center for the chart. Fig. 1. 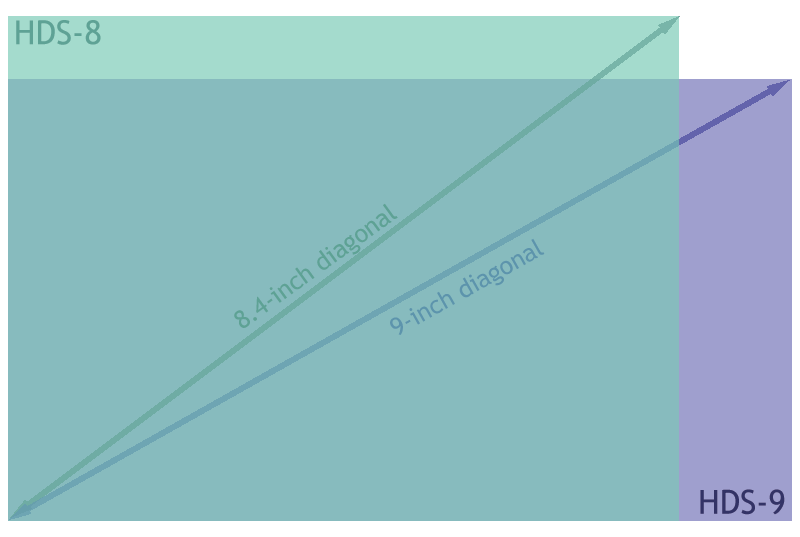 Comparison of screen size between HDS-8 and HDS-9. This graphic assumes the display in the HDS-9 is a 16:9 aspect ratio.